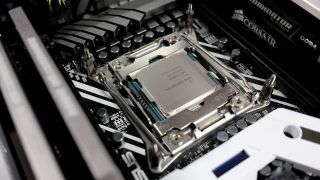 Last month, a rumor emerged that Intel was preparing a special anniversary edition Core i7-8086K processor – to mark the 40th birthday of the release of the first 8086 chip on June 8, 1978 – and now multiple retailer listings for the CPU are being spotted. As Videocardz reports, the niftily-named Core i7-8086K has been listed by Italian, Canadian and US retailers amongst others, and according to these product listings, the price is set to be about €480 or $480 (around £360, AU$640). That’s about $70 (around £50, AU$95) more than Intel’s Core i7-8700K. Of course, we have to take that pricing with a shovelful of salt, and indeed the existence of this Core i7-8086K is still unconfirmed, of course. At least one of the aforementioned product listings is still live, although the Italian retailer in question has already taken its web page down. So, this is certainly further evidence that such an anniversary edition processor does actually exist, but we can’t get too carried away at this point. However, fingers crossed that this becomes a reality, because the chip’s rumored spec based on these fresh product listings is that it is capable of boosting to 5GHz out of the box, which would make it the first Intel chip to do so (with a purported base clock of 4GHz according to previous speculation). That speculation also shows the Core i7-8086K is a six-core (12-thread) processor with a TDP of 95W. The good news is that we’ll know for sure what’s happening a week on Friday, as that’s June 8, the anniversary date in question.